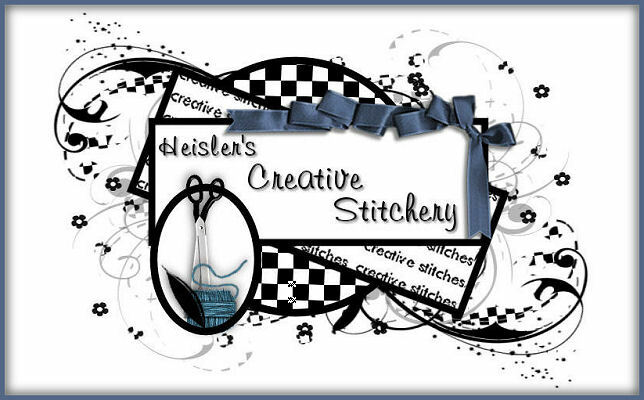 Heisler's Creative Stitchery: Surprise! I'm back again! 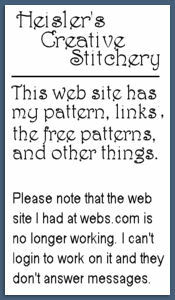 I've been perusing some of my favorite blogs and realized I should be writing instead of reading! The pic above is of the Christmas Witch I made. It's over at the ebay store and remember all my dolls have free shipping all the time, not just for the holidays. 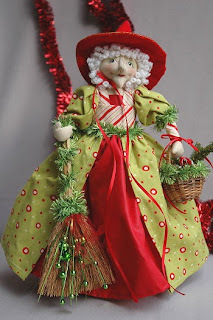 The great thing about this doll is that the hat is removeable and the broom and basket at not sewn to the hands. If you like her but don't want a witch you can remove them. In fact if you say you read it here in I'll make her a different hat and instead of the broom I'll add another basket! Now you can have a Christmas Granny instead of a witch. If you're still looking for Halloween dollies, mine are still up at ebay. I find I tend to sell more of them at Christmas than at Halloween! I thought I finished the bears for Tapas last night but as I was showing them to my husband I noticed I had forgot to stitch two sections in one bear's legs. At least I noticed it before packing them for the PO. Oh well, I'll do that tonight while I stuff some of the small teddy's I sewed up this afternoon. I still have a few to cut out. I found I got 8 out of the jacket I cut them from. There's a bit left so I may do a rabbit or pig out of it. Also planning on finally getting a snow fairy or 2 cut out if I can decided on the fabric. WooHoo, I'm finaly in the mood to sew again! Now if my cold would just go away so I'd have more energy.